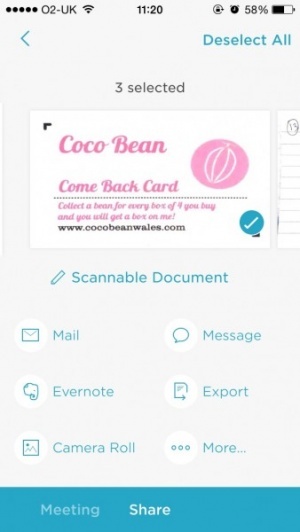 Scan mostly any document you could need with Evernote Scannable. Not quite as feature-rich as more expensive apps, Evernote Scannable is still a near essential download for anyone trying to get on top of a mountain of paperwork. Taking mere moments to figure out, Evernote Scannable allows you to automatically scan mostly any kind of document possible - from receipts and contracts to business cards and Post-it notes. 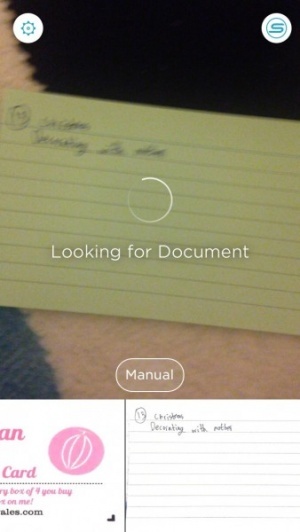 You simply point your iOS device’s camera at the thing you want to scan and Evernote Scannable does the rest. It helps if said item is on a clear background, but that’s far from overly restrictive. In a matter of moments the app easily scans things in, displaying the completed image on screen. Evernote Scannable does most of the hard work, including automatically rotating and cropping images to capture exactly what you want to see. That’s a double-edged sword given that it doesn’t offer the ability to adjust brightness or contrast manually, but it’s a service that mostly works and simplifies the process greatly. A mixture of gestures and clearly laid out taps further makes controlling a series of different images pretty easy. In the case of business cards, Evernote Scannable can then easily translate that information into contact information, with LinkedIn details also included. It can save you a bunch of time after a busy networking session. With everything else, you can easily send documents to colleagues, save them to Evernote, or transfer them to other apps for more flexibility. It’s not quite perfect given how its automation limits your own options, plus there's its reliance on other apps to complete certain tasks. But given the speed and its non-existent price tag, it’s hard not to recommend Evernote Scannable. It really will save you a lot of time.